North Korea announced it had conducted its first successful test of a miniaturized hydrogen bomb (thermo-nuclear device) after several nations detected a moderate earthquake near a known nuclear testing site on January 6. If confirmed, the test would mark North Korea's fourth nuclear test defying United Nations sanctions and would represent a major step forward to developing nuclear weapons. Pyongyang's announcement came after a 5.1-magnitude quake was detected close to its nuclear test site at Punggye-ri, indicating a test may have been conducted. The move sparked strong condemnations around the world. The UN Security Council, South Korea, and Japan all called emergency meetings to respond to the test, which Japanese Prime Minister Shinzo Abe "strongly condemned" and called "a threat to our country's security [that] is totally intolerable." Japan and South Korea vowed to work through the UN to penalize North Korea, while the White House said it will take "appropriate" action in response to North Korea's "provocations." South Korea's Defense Ministry also said it is bolstering security and monitoring of North Korea. Lassina Zerbo, head of the Comprehensive Nuclear-Test-Ban Treaty Organization, called the test "a grave threat to international peace and security." In Washington, White House National Security spokesman Ned Price said: "While we cannot confirm these claims at this time, we condemn any violation of UN Security Council resolutions." "We will not accept North Korea as a nuclear state," he said in a statement. NATO called on North Korea to abandon its nuclear weapons and ballistic-missile programs in a "complete, verifiable, and irreversible manner" and engage in "credible and authentic talks on denuclearization." China's Foreign Ministry said Beijing did not have advance knowledge of North Korea's test, adding that it firmly opposes Pyongyang's action. Ministry spokeswoman Hua Chunying said China -- a key ally of North Korea -- would work with the international community on the decentralization of the Korean peninsula. In Russia, a spokesman for President Vladimir Putin said Moscow was "extremely concerned" by the claimed test and that Putin had told scientists to look into it. France called for a "strong reaction from the international community," while Germany said it would summon North Korea's ambassador. Speaking in Beijing, Britain's Foreign Minister Philip Hammond said the test was "a grave breach of UN Security Council resolutions and a provocation." North Korea, which has long pushed for warheads that can be mounted on a missile capable of reaching the mainland United States, said it will not give up its nuclear program as long as the United States maintains "its stance of aggression." The rogue regime claimed it will act as a responsible nuclear state and not use the weapons unless its sovereignty is infringed, nor will it transfer its nuclear capabilities to other parties. The test came just two days before North Korean leader Kim Jong Un's birthday. Kim hinted last month that Pyongyang had already developed a hydrogen -- or thermonuclear -- bomb -- a claim greeted with skepticism by experts at the time. Some experts still cast doubt on North Korea's latest claim, saying the detected seismic activity suggests a less powerful device. 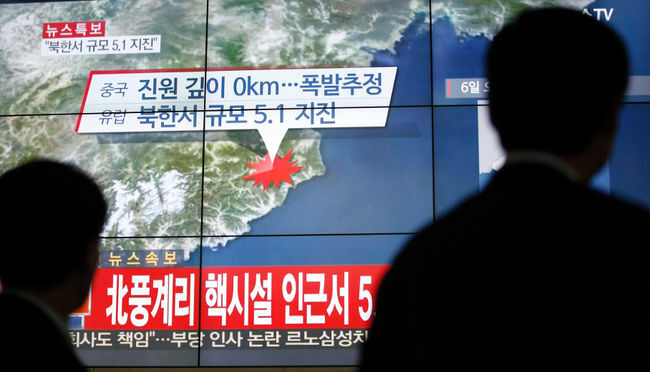 The AFP news agency quoted Crispin Rovere, a nuclear policy and arms control specialist, as saying the 5.1-magnitude tremor detected at the test site was too small to support Pyongyang's claim. "The seismic data that's been received indicates that the explosion is probably significantly below what one would expect from an H-bomb test," the Australia-based expert said on January 6. Chinese broadcaster CCTV quoted a Chinese military expert as saying data so far "cannot support" the claims of a hydrogen bomb test and that further analysis was required. North Korea has carried out three previous nuclear tests -- in 2006, 2009, and 2013 -- which led to a series of UN sanctions against Pyongyang.